This Is A Guarantee You Can Trust! When you purchase a new or pre-owned vehicle at Clawson Honda of Fresno, you will feel confident in knowing that you’re the proud, new owner of a quality vehicle. Other dealerships may promise that their vehicles are solid, in great shape and without problems but at Clawson Honda of Fresno, we warrant the condition of this vehicle with an Engine for Life Warranty. Our Engine for Life Warranty ensures repair or replacement of any covered engine component that fails during the warranty period. Your engine is covered for as long as you own your car. 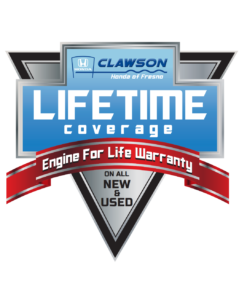 Our Clawson Honda Engine For Life Warranty cover all current, plus 10 prior model years under 100,000 miles. Our Engine For Life Warranty is included with the vehicle purchase of all current, plus 10 prior model years under 100,000 miles at NO additional cost. Can It Be Used At All Honda Dealerships? Yes, as a matter of fact, it can be used at any Honda Dealership, franchised Automotive Dealer or authorized licensed repair facility or franchised Automotive Dealer of your choice in the Continental United States. Just present your contract and the repair facility will handle the rest. Is This A Reputable Warranty? Yes, it is. Our Clawson Honda Engine For Life Warranty is backed by (DAC) Dealers Assurance Corporation, which has maintained an AM Best Excellent Rating & Stable Outlook since 1977. They have over $100 million dollars in assets. Will I Get Something In Writing? Yes, you will receive a contract that you can present to any authorized Honda Dealer or authorized Honda Repair Facility. Your Engine for Life Warranty provides coverage for the following component parts. All internally lubricated parts contained within the engine block and cylinder head (s) including: internally lubricated parts, including: pistons, piston rings, wrist pins and bushings, connecting rods and rod bearings, crankshaft and main bearings, camshaft, cam chains, cam bearings and cam cover, timing chain, gears, tensioner and guide, variable valve timing parts, rocker arms, shafts and bushings, rocker arm pivots, adjustment screws, spring and tension controller, valves, valve seats, valve springs, valve spring retainers, valve guides, valve push rods, hydraulic valve lifters, oil pump, oil pump drive, shaft and gears. Cylinder head, engine block and rotor housings when damaged as a result of the failure of a covered internally lubricated part. Seals and gaskets when required in connection with the repair or replacement of a covered part. Coolant, lubricants and oil filters when required in connection with the repair or replacement of a covered part. 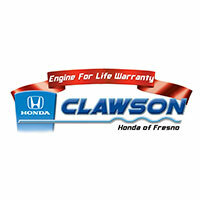 *Certain makes and models may be excluded from the Clawson Honda Engine For Life Warranty. See you Clawson Honda representative for further details.